If you’ve ever thought that Twitter’s interface for displaying profiles on phones was a bit wonky, don’t worry. You’re not alone. Even Twitter agrees. Twitter has just rolled out a new profile interface for iOS users that they’ve been quietly testing for the past few months. The biggest change? They no longer inexplicably hide everyone’s bio line behind a swipe. Because, seriously… why the hell were they doing that? Why would you not want to see someone’s bio line when you click into their profile? Your profile will now lead with your background image, your avatar photo, and your bio. Beneath that are three buttons: one that shows your tweets; one that shows just the photos you’ve shared; and one that shows everything you’ve fav’d. 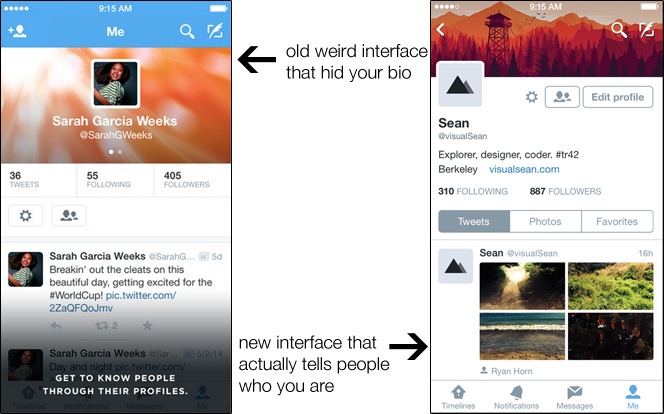 Beyond the profile tweaks, the primary changes are all about embracing the new stuff Apple opened up in iOS 8. You can now retweet/fav/follow/etc. in response to any tweets that pop up on your screen via push notification, for example. Alas, bios are still wonky and hidden in the latest version of Twitter for Android.